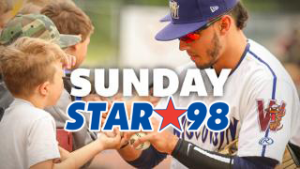 Star 98 is spending Sundays with the Timber Rattlers all season long. Join us for Brewer Sunday Home Games. Play catch on the field before the game, get an autograph after the game and watch the Rattlers in their Brewer Themed Sunday Uniforms. Also listen to Star 98 for the chance to win a 4 PAck of tickets and if you have kids, one might even be selected to be our Star 98 First Pitch Kid and you got it, throw out the ceremonial first pitch! Pre-game catch on the field Presented by Rasmussen College. Post-game player autographs Presented by Tundraland. Special navy blue Brewers-themed jerseys worn on-field by Timber Rattlers players. Brewers 4-pack ticket giveaway Courtesy of AAA. In partnership with Star 98.